Once in a while a recipe catches on like wildfire and sends people straight to the kitchen. 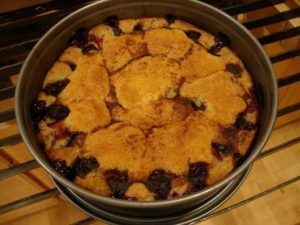 One such recipe is Plum Torte, a simple to make butter cake topped with Italian prune plums, lemon juice, sugar and cinnamon baked in a spring-form pan. 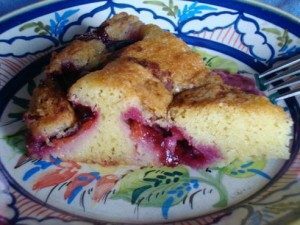 New York Times food columnist Marian Burros was given a recipe for a plum torte soon after she married. She published the recipe for the first time in 1984, and since then it has become the New York Times’ most-requested recipe. In her wonderful book, “De Gustibus,” a collection of her food columns with essays, Ms. Burros describes making the tortes assembly-line fashion so that she’d have an abundant supply to brighten up dreary winter days. “Well,” her friend said, “My mother either ate 12 of them or gave them away.” The tortes weren’t labeled as to ownership, so the mother couldn’t have known whose they were. But they sure were a hit. And I guarantee they will be with you, too. Here’s my adaptation of Mrs. Burros’s recipe. This torte is best when very fresh. But it is delicious a day or two later if kept covered in the refrigerator and brought to room temperature before serving. To make several and freeze, bake the tortes one at time the following way: Line the baking pan (a 9-inch spring-form pan) with foil and butter the foil. After baking and cooling, detach the sides of the pan and lift the foil-lined torte off the pan bottom. Fold the edges of the foil carefully on top of the torte, wrap tightly in plastic wrap and another layer of foil, enclose in a heavy-duty re-sealable plastic bag, date, and freeze. The torte keeps well for up to 1 year. To serve, thaw completely in its wrappings. Unwrap the torte, set it on a baking sheet, and refresh in a preheated 300 degree oven for about 10 minutes. Adjust an oven rack to the center position and preheat the oven to 350 degrees. Wash and dry the plums. Cut them into halves along their seams and remove their pits. Butter a 9-inch spring-form pan. Don’t use cooking spray because it’s wet, and the thick batter will not adhere to it. For the torte, whisk together the flour, baking powder, and salt in a medium size bowl. 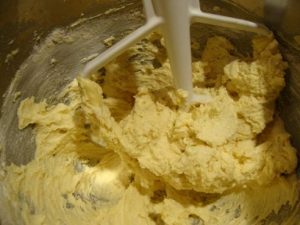 Beat the butter until smooth on medium speed with an electric mixer, about 1 minute. While beating, gradually add the sugar in a thin stream. Scrape the bowl and beater and add the vanilla. Beat 2 to 3 minutes on medium speed until fluffy. Add the eggs one at a time, beating well after each. 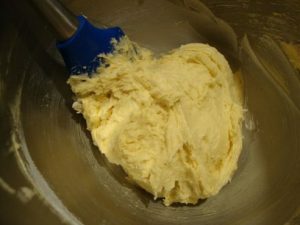 Add the dry ingredients and beat on low speed just until incorporated and batter is smooth and thick. 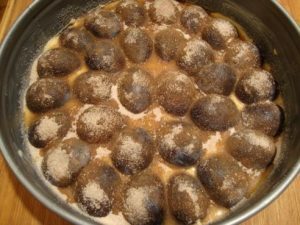 Spread batter evenly in the prepared pan (an offset metal spatula is ideal for this job) and arrange the plums cut side down in tightly-packed concentric circles on top of the batter. Drizzle lemon juice over the plums. Combine the 2 tablespoons sugar with the cinnamon and sprinkle evenly over the plums. Bake 50 minutes to 1 hour. A toothpick inserted into the center of the cake part should come out clean. The plums will have been engulfed by the batter during baking with a few purple patches dotting the surface. Cool the torte in its pan on a wire rack. Run a small paring knife around the sides of the torte to release from the sides of the pan. Remove the sides of the pan, cut the torte into wedges, and serve. After Ms. Burros first printed the Plum Torte recipe in 1984, a recipe which she says “Is one of the simplest I know,” she received an avalanche of mail from readers with various questions and complaints. One reader demanded an apology because the batter had leaked out of the pan and ran all over the oven. If you have a spring-form pan with sides that doesn’t clamp on tightly, either buy a new pan or wrap the outside of the pan tightly with foil. This will solve the problem. Another reader wrote to say that “The cake swallowed up the plums! Could there have been a typo in the recipe?” No, was the answer. This is supposed to happen. One writer said the torte was not done after an hour’s baking. The reply? Check the temperature of your oven with an oven thermometer. One hour at 350 degrees is exactly right. Ms. Burros received so many letters that she ran the recipe again the following year. Now you have the recipe. Not only is this recipe fantastic as is, but it is infinitely adaptable. I’ve had success making it with other fruit such as a combination of peaches and blueberries. You can also sub some of the all purpose flour with almond flour. Thank you, Amy, for your fruit and almond flour suggestions. You’re so right about this recipe’s adaptability.